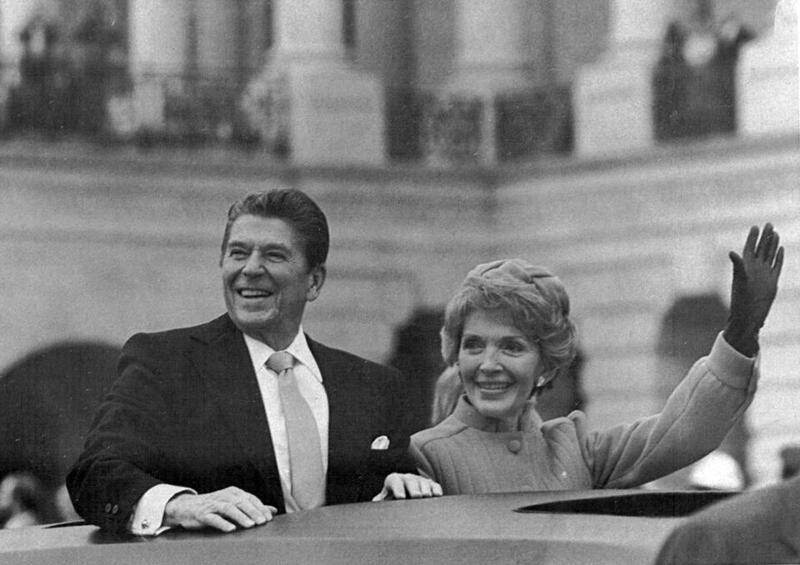 First lady Nancy Reagan waved after the inauguration of her husband, President Reagan, in Washington on Jan. 20, 1981. NEW YORK — Nancy Reagan, the influential and stylish wife of the 40th president of the United States who unabashedly put Ronald Reagan at the center of her life but who became a political figure in her own right, died on Sunday at her home in Los Angeles. She was 94. Nancy Reagan was a fierce guardian of her husband’s image, sometimes at the expense of her own, and during Ronald Reagan’s improbable climb from a Hollywood acting career to the governorship of California and ultimately the White House, she was a trusted adviser. 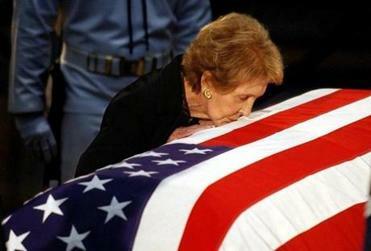 Nancy Reagan kissed her husband’s casket as it lay in state in the US Capitol’s rotunda. 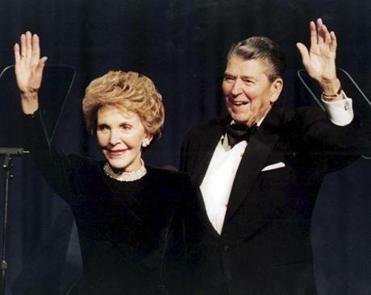 “Without Nancy, there would have been no Governor Reagan, no President Reagan,” said Michael K. Deaver, the longtime aide and close friend of the Reagans who died in 2007. Nancy Reagan played a strong part in Ronald Reagan’s political career and in his presidency. Mrs. Reagan helped hire and fire the political consultants who ran her husband’s near-miss campaign for the Republican presidential nomination in 1976 and his successful campaign for the presidency in 1980. She played a seminal role in the 1987 ouster of the White House chief of staff, Donald T. Regan, whom she blamed for ineptness after it was disclosed that the president had secretly approved arms sales to Iran. Behind the scenes, Mrs. Reagan was the prime mover in his efforts to recover from the scandal, which was known as Iran-Contra because some of the proceeds from the sale had been diverted to the Contras opposing the leftist government of Nicaragua. While trying to persuade her stubborn husband to apologize for the arms deal, Mrs. Reagan brought political figures into the White House, among them the Democratic power broker Robert S. Strauss, to argue her case to the president. His wife, typically, neither sought nor received credit for the turnaround. Mrs. Reagan did not wish to detract from her husband’s luster by appearing to be a power behind the presidential throne. Born Anne Frances Robbins on July 6, 1921, in New York City, Nancy Davis was the daughter of Edith Luckett, an actress, and Kenneth Robbins, a car dealer who abandoned the family soon after her birth. Luckett resumed her stage career when her daughter was 2 and sent the child to live with relatives in Bethesda, Md. In 1929, Luckett married a Chicago neurosurgeon, Loyal Davis, who adopted Nancy and gave her the family name. Almost overnight, Nancy Davis’s difficult childhood became stable and privileged. 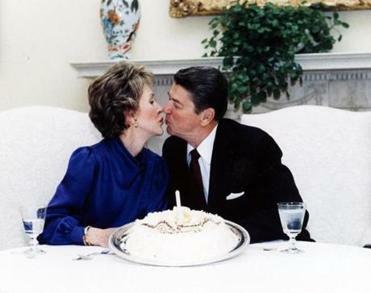 The first lady and the president marked their wedding anniversary at the White House in March 1985. Nancy Davis graduated from Smith College in 1943. Slender, with photogenic beauty and large, luminous eyes, she considered an acting career. After doing summer stock in New England, she landed a part in the Broadway musical “Lute Song,” with Mary Martin and Yul Brynner. With the help of a friend, the actor Spencer Tracy, her mother then arranged a screen test given by the director George Cukor, of MGM. She was given a part as a socalite in “East Side, West Side,” which was released in 1949, starring Barbara Stanwyck. She appeared in 10 more films from 1949 to 1956. Nancy and Ronald Reagan starred together in her final film, the drama ‘‘Hellcats of the Navy’’ (1957). Ronald Reagan and Nancy Davis were married on March 4, 1952, at a private ceremony at The Little Brown Church in the Valley, in Studio City, Calif. William Holden and his wife, Ardis, were the only witnesses. Although Mrs. Reagan was not at first keen on her husband’s entry into politics, she loyally supported him. From the first, she was part of the campaign planning. “They were a team,” said Stuart Spencer, who helped manage Reagan’s campaign for governor of California in 1966 and for the presidency in 1980. New to politics, she said little at first. But Spencer found her “a quick learner, always absorbing.” Before long she was peppering Spencer about their strategy and tactics. 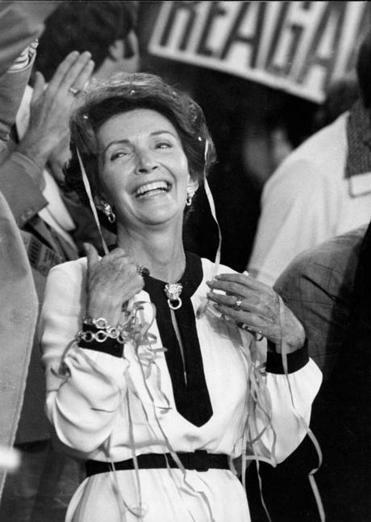 Nancy Reagan celebrated as her husband’s name was put in nomination at the 1976 Republican convention in Kansas City. Reagan won a contested Republican primary for governor in 1966 and then a landslide victory in November against Democratic incumbent Edmund G. Brown. Ronald Reagan left the governor’s office in 1975. By then, the Reagans were planning their next political move. After President Nixon resigned and was succeeded by Gerald R. Ford, Reagan began planning to challenge Ford for the 1976 Republican presidential nomination. Reagan narrowly lost the primary battle but ran again four years later. Mrs. Reagan had a hand in the firing of campaign manager John Sears after the New Hampshire primary in 1980 and the hiring of William J. Casey, whom Ronald Reagan later named director of central intelligence. But after Reagan won the nomination and got off to a flustered start in his campaign against incumbent Jimmy Carter, Nancy Reagan urged her husband to bring in Spencer, who was persona non grata in the Reagan camp because he had managed Ford’s campaign in 1976. But Reagan followed his wife’s advice. Spencer joined the campaign and ran it smoothly. In the White House, Mrs. Reagan was known as a meticulous taskmaster, and many staffers recalled that they feared incurring her disfavor. As first lady, she traveled throughout the United States and abroad to speak out against drug and alcohol abuse by young Americans and coined the phrase “Just Say No,” which was used in advertising campaigns during the 1980s. After the presidency, the Reagans returned to Los Angeles and settled in a ranch house in exclusive Bel Air. In 1994, the former president learned he had Alzheimer’s disease and announced the diagnosis to the American people in a poignant letter, which Mrs. Reagan had helped him write. At Ronald Reagan’s funeral at the National Cathedral in Washington, she remained in tight control of her emotions. Then she flew west with the coffin for a burial service at the Ronald Reagan Presidential Library in Simi Valley, Calif., where she will also be buried. 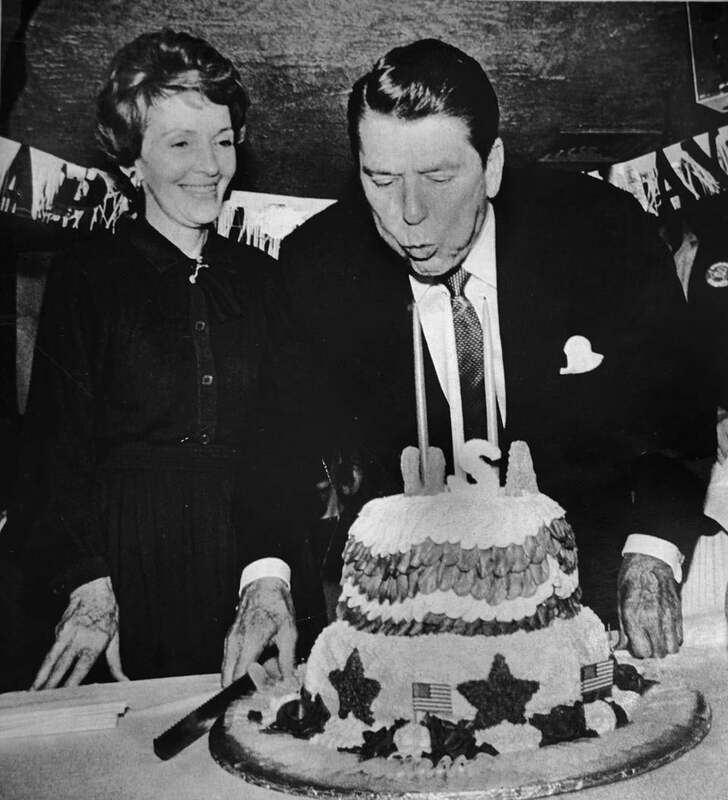 Nancy Reagan helped Ronald Reagan celebrate his 69th birthday as he campaigned in Hooksett, N.H., in 1980.